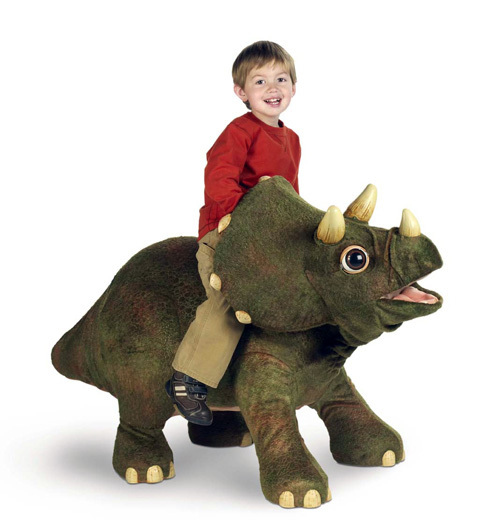 Be A Dino-Rider With Rideable Triceratops | OhGizmo! This cute little guy is KOTA, a 40 inch long battery powered baby triceratops. If you’re a preschooler, you can ride comfortably on KOTA’s spring-loaded back, holding onto a safety handle hidden under his frill. He’s got 11 touch-sensitive areas on his body and will move his head, tail, or horns in response to a little luvin’. He’ll even pretend to eat fake leaves, and roar at you if you talk to him. A “friendly” roar, says Hasbro. They also claim the roar is “realistic,” but I’m not sure how they figured that one out. He’ll cost about $300, and runs on 6 D batteries. 6 D batteries… That rings a bell… Oh, right! This thing takes 6 D batteries! The obvious thing to do when KOTA comes out in fall of this year is to buy it along with the Nerf Vulcan and a dozen D batts, and turn yourself into a real life Dino-Rider. Remember Dino-Riders? 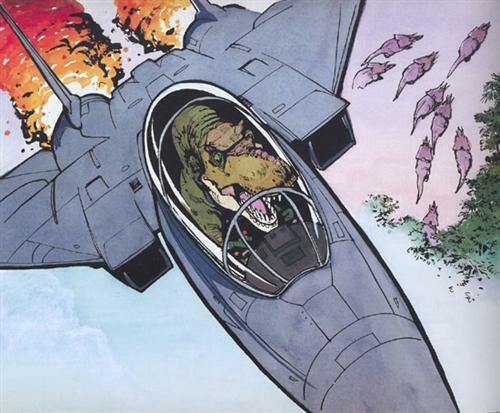 Relive some of the glory days of 80s killer cyborg dinosaur cartoons, after the jump.